Happy paperback launch day, Hank . . .
Mass-market paperbacks . . . yes, I do buy them, I do read them, and I do keep them. Although I often pass them up if I’ve already gotten and read the book when it first came out, it’s hard to imagine them going away. And it’s exciting when there’s a special “bonus” in the book. Of course, there’s no such thing as too many paperbacks [or any other type of book] . . . . Thank you! Yes, there's a lot of talk about their demise, but they are perfect for so many situations… and I have purchased many an emergency paperback at the airport! Oh, happy paperback birthday, Hank! Mass market paperbacks are so much fun and they seem to be making a comeback. Maybe because they are so portable and their batteries never run out at inconvenient times. Joan is right, it's exciting when there's a special "bonus" in the book. Always makes me pre-order. Hank, Happy Paperback Publication Day! I buy paperbacks because they are affordable. You can buy 2-3 paperbacks for the cost of a hardcover so it makes economic sense. I don't believe they are going the way of the transistor radio (and since I have a transistor radio, that shouldn't be a surprise). I have way too many, and I end up giving away some to family members that read or to the library. I'd love to keep every book I read and like but I'd soon be overrun if I did that. So I have to be slightly ruthless in deciding which books I keep. And I always think about how happy the recipient will be when I give them the book, right? You have a transistor radio? I haven't seen one in years! Hank, I buy the hardcovers of the authors that mean the most to me and save those. And yes, I have the radio. I also have one of those old time radios from way back in the day when it used to belong to my grandfather. It still works. Happy book birthday Hank! 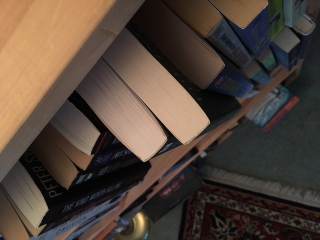 I'm noticing in our local wonderful bookstore that paperbacks are few and far between. This makes me sad, because I think it's a publisher decision about money-making, rather than based on what readers want! Guess I am in the minority here! I prefer not to read a paperback, mostly because I find the print is too small. My other reason is if it is brand new and fairly thick then it is difficult for me to hold the book open enough to let the light in to read it and then my hand hurts. But sometimes that is all that is available and in that case I will happily read one and then keep it or give it away! Yes, I have had that experience! They can be awkward, and then the pages start coming out… but they are convenient! I have all the same problems that Judi has with mass market paperbacks, but mostly it is the small print and the quality of the paper. However I've bought thousands of them in my lifetime. Most of them I've given away. Still I prefer the trade paperbacks, just a nicer "hand." Happy paperback day, Hank! I have completely switched to ebooks. I simply have no more room for print books. My husband is also a bibliophile so our house is FULL of books! I love my Kindle because I can carry around literally hundreds of books and afford to buy "hardback" books. I pre-order whenever I can so release day is like Christmas!
! Yes, I have to admit, ereaders are sort of like magic. I'll never forget the first time I saw someone order my book right in front of me… It was just… Open the ereader, search, click, and there it was. Amazing. I completely agree, Cathy. September is going to be big for Kindle surprises too. Isn't it fun to open it up and see a new book! When you read this blog, is it visible on your post where you can click for the offer? Congrats on the MMPB publication day, Hank. I still buy MMPBs, and like you, I have them piled two and three deep on some shelves. Every so often I'll get tired of them falling off and sort through and take a batch to the library. Re: is it visible? I see the link near the end of your intro, a couple of paragraphs before the comments start. Is that what you were asking about? I'm curious about the teaser for your new standalone: is the book so complete that we should expect the excerpt to be just as it will be in the final copy? Or will there be some fine tuning between now and then? Well, that is a good question! TRUST ME is complete, and the advance reader copies are being printed now. From the same manuscript as is in the paper back. I'm pretty sure nothing will change. Is that a good thing or a bad thing? And I am sure there are typos in the excerpt--they made the decision to include it at the very last minute. And at the FIRST minute the final book was done. So all those will be fixed, of course! Happy paperback release day, Hank! Yes, I can click the link for the offer, and yes, I still buy paperbacks. In fact, since I somehow missed the release of Say No More in hardcover, I may stop by Barnes and Noble on my way home and buy this one. As to what I do with them after . . . those of us who live in the Dallas area are fortunate to be in the home of Half Price Books--perhaps the most awesome chain of used book stores ever. I read a lot of books, in hardcover and in paperback, and if I decide not to keep them, I put them in a box. When the box is full, I cart them off to Half Price and "release them back into the wild" for someone else to enjoy. I take good care of my books, so they're in nice shape, and there's no reason why someone else won't enjoy them too. Plus, I can use the money I get from selling them back to buy new books! So happy you still buy paperbacks! Hooray! Let me know if Barnes & Noble has it… You can be my scout, OK? And don't forget to enter the offer! I searched high and low, but all I found at my local B&N was a trade paperback copy of Prime Time. Off to Amazon, I guess! Happy paperback release day! I used to buy scads of MMPB books. Mostly in college because I was a poor college student and they were cheap. As you say, easy to transport, too. I lost one at a taekwondo tournament for one of my kids years ago, but not nearly as traumatic as losing a hardcover. I don't buy many these days, mostly friends who have books that only release in that format. I have a giant rubber bin of them in the basement and I really do need to go through them. I think the fact that I haven't missed any of them in years is a sign that I should send them on to a new home where they will be appreciated. Handing out books is like being Johnny Appleseed, right? But what would you call and Johnny Appleseed of books? Hmm. Johnny Paperseed? No, that doesn't sound quite right either. Johnny iPad? Oh that's baaad. Almost without exception, when I finish reading a book (either hard or soft cover), I give it to someone else. So, most of what is left on my shelves are books I cannot part with (primarily poetry and spiritual books)and books I haven't read yet. When I am reading the book I think about who might be interested in it -- my sister, a friend, my mother. Right now I am nearly finished "The Jungle" by Upton Sinclair. It's amazing and should be required reading for every American. (I am so done with capitalism.) But I don't think I'm ready to share this copy. I continue to buy books! Forgot to say that I also donate used books (and audiobooks on CD) to my library and to a place where I volunteer, New Haven Reads. Yes, donations to the library--great. Do they sell them? Or give them away? This whole post and reaction is making me wonder about the accumulation element of books. Hmm. Falmouth library has a huge sale in early July and a continuing sale shelf, honor system, at the entrance. New Haven Reads provides free books for classrooms and for everyone in New Haven. I tutor there. Amazing organization. Great! Such a wonderful feeling to do that, right? Congratulations! I read paperbacks since they are light and easy to transport. When I finish reading I let someone else enjoy the books, friend, family neighbor or library. And authors hope you are sowing the seeds for new fans! When I have too many paperbacks, I donate them to the library book sale. I try to donate books that still look nice. I do not like to donate dusty books. I have a few favorite authors whose books I keep forever. Some of their books are now out of print. I was lucky to find a copy from a used book dealer at Malice Domestic in 2016. Paperbacks are easier to read at bedtime because when I fall asleep, the hook hits me on my nose! If a hardback hit me in the nose, then ouch! With paperbacks that I really want to keep, I put them in a book bag or in one of my drawers. I ran out of bookshelves. My home has little space and I think outside the box. For example, I created a "table" out of a pile of favorite books. Sometimes I give paperbacks as Christmas gifts. If it is a book I have read before and I really like the book, I buy copies to give as Christmas gifts. I love books in any format. The hard copies I have are mostly mass market paperbacks, but the trade paperbacks are slowly catching up to them. The rest are on my iPad, which makes storing a lot less complicated. I could never sigh and wonder what I would do with another book -- they are treasures in whatever format I may have. Isn't that the truth? We're like--bring them on! Happy bookday Hank. Since I have (ahem) an inscribed first edition hardback, I probably won't be reading the mass market version, but I'll definitely pick it up and point it out to other shoppers as a chance not to be missed! Yay! Congrats on the release of your paperback, Hank! I will read in any format - mass market, trade, hardcover, e-book on a Kindle or even my phone - I don't discriminate. It really just depends upon what format the book comes into my life. I read on the phone when I'm waiting for the Hooligans, the Hub, a friend. Hi, everyone! Out shooting a story… Back soon! Paperbacks are particularly good for reading in the tub since hardcovers can be too heavy and unruly! I'll buy a book, regardless of format, if I want to read it. I give every book away when I'm done, with the exception of signed copies or reference books that I'll need for future manuscripts. And happy pub day, Hank! I'm in awe of your many talents and endless energy! Aw, Ingrid, back at you. Thank you. Hank, happy pub day!! My hardcover copy of Say No More has pride of place on my "keep" bookcase (or it will if I every get those books in office sorted...) along with the other REDS books! And, yes, I do still read MMPBs. Although I've learned to love my Kindle (since I got a Paperwhite) nothing beats a mass market for certain situations. Even with a Kindle, I never get on a plane without at least one real book! I do save some of them, too. Lucy's, for instance, as they're only published in MM. And paperbacks of some of my favorite series, if I don't own them all in hardcover. But, like Gigi, when I have shared with Gigi and Kayti, most of mine go on to other readers through our terrific Half Price Books store. HAPPY PAPERBACK LAUNCH DAY, SWEETIE!!!!!! I love hardbacks, I love paperbacks, AND I love electronic(back) books. There are very different things I like about each. For friends' books, I want a hardback, if available, and I want it inscribed and signed and I will cherish it forever. IF it's available in paperback only (or first! ), I want it inscribed and signed and I will cherish it forever. I love love love being able to push a magic button and have an older book by a recently discovered, by me, author at 1 a.m. and magically be able to read one of their novels. There is no end to joy I find in this. So - books. Give them to me in all shapes and forms. It's all good. Happy Launch Day for your paperback, Hank! Like Kaye, for friends' books and favorite authors, I always want the hardback so I can get it signed. There are a few favorite authors who publish in trade paperback, and those are fine, too. And, if the book is only available in MMPB, I can handle it because I love a series or author. I do own quite a few mass market paperbacks, but I'm trying to weed those. I currently buy a MMPB only when a hardback or trade paperback isn't available, or in the case of a couple of books I was behind in in a series that were so much cheaper than the HB and no trade was available. The thing is that the print is really too small for me these days in the MMPBs. I don't need a large print copy of books, but I do prefer the hardback and trade paperback size of print. Let me know how the weeding goes! Love to know your system! 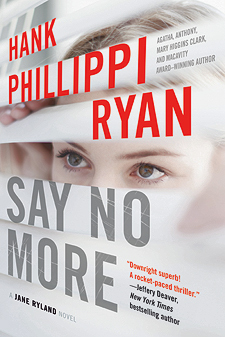 Oh, and Hank, it's so exciting that the first three chapters of Trust Me is in the paperback of Say No More! I am so looking forward to your standalone, and getting a sneak preview is awesome. When I have too many paperbacks I put some of them in the "Little Free Library" by my house. I also bring paperbacks on trips because if I finish them I can just leave them behind in hotels, airports, or on airplanes. (I usually put a note in them saying "free book" and hope it is not just thrown away.) On cruise ships, if they are in good condition, one can donate them at the ship library. There are so many books that are only published as paperbacks so I feel like I would be missing some really good books (typically older books) if I didn't read them. Plus our thrift store sells them for 75 cents. And I donate them back to them too! Love the note idea! And the little free library boxes are adorable--we see them on our walks all the time! I am going to drop a few books every time now! I need paperbacks for reading at appointments and on the bus. I also share some romance books with a friend. I usually get hardbacks or trade paperbacks at the library because of the price. Also read on my Nook. Now I only keep a few authors' books so give the rest to the library. Happy paperback birthday! I love MMPBs--especially those I find in used book stores of authors who may be out of print. Those great mid-twentieth century authors--John Dickson Carr comes to mind. So weird! And I do have books stacked two deep on some shelves. The "classic detective" section of my shelves is hiding behind "science" and "history". There's no other place for it!